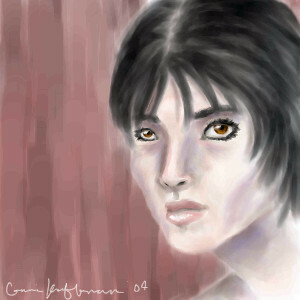 2draw.net - boards - Intermediate - Kasha-inspired. [Like the title says. Yep. >__>] Done, I think. Very nice VV.. the right eye looks a bit small in relation to the left but its nice. comment: I like the smooth brush strokes you've applied to this portraiture.The skin tones are great and I love the purple highlights.The hairstyle is awesome and has that lovely 'woosh' effect that I always favor.Like Davinci said, the eye on the left looks a tad bit smaller in relation to the other. It's tedious sometimes to get the eyes working, I think everyone seems to have a hard time with that, eventually it'll kick in. The background is totally something I would do. Very painterly. Overall, fantastic job! Very Kasha-like. :) She definitely has one of the coolest, uninhibited styles going around here. It's probably such a leap from mine I don't think I'd know where to begin. You even got close to the palette she uses. Shows you are very observant and insightful.